Yummo Mummo | A jumpsuit right on Target! A jumpsuit right on Target! As you have already heard me say, I am jump(suit)ing for joy that we have these one piece lovelies in for another summer. I love an all-in-one that you can just slip into, throw on a few accessories and be ready to rock it out the door. 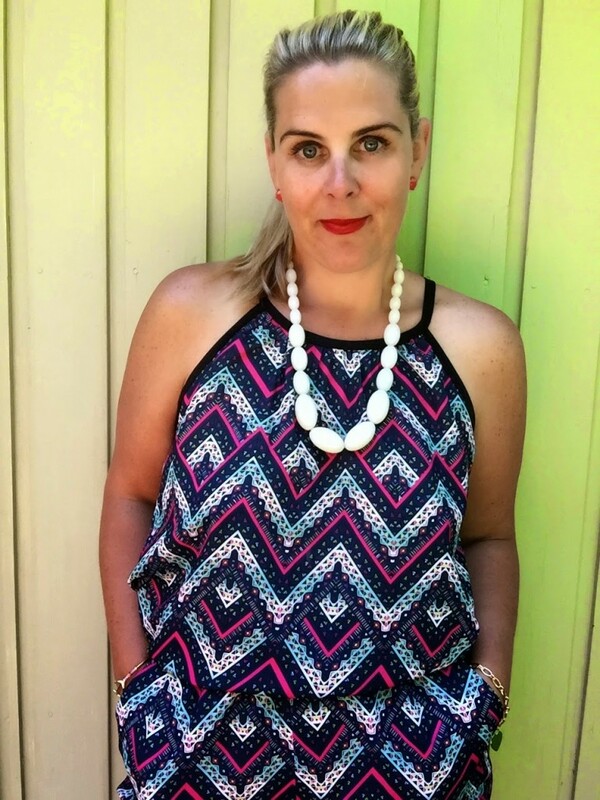 I found this fun jumpsuit at Target on a recent galavant. Boy, oh, boy I am loving it! I have paired it with some slip-on blinged out sandals, and finished the outfit off with a fresh white beaded necklace. 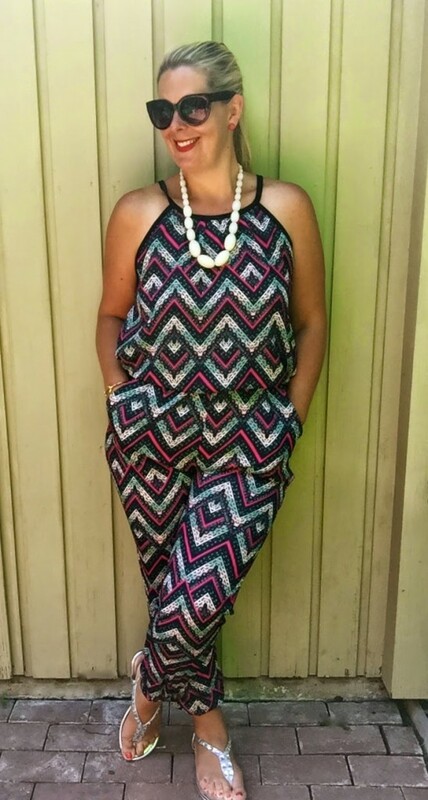 (Xhilaration Printed Tulip Top Jumpsuit // $29.99 HERE) Pockets! As you know, I adore pockets in a jumpsuit or a dress. Makes a casual outfit all the more fun. Click HERE to read another fun jumpsuit adventure I had at Marshall’s recently. This jumpsuit is going to bring me a lot of fun as I head into summer 2015, ready to relax with the kids and have some summer adventures. I picked up these sunnies at H&M during the winter and I have worn them a tonne. Love, love, love them! I recently picked up these sandals from Payless on a BOGO offer. I got them for $10. Happy Days! A shout out to my little photography sidekick. He is so patient with me. 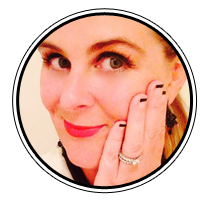 I am a Mum to three little ones, but I am also my own photographer, make up artist, hair stylist, wardrobe stylist, editor, writer, and dreamer. 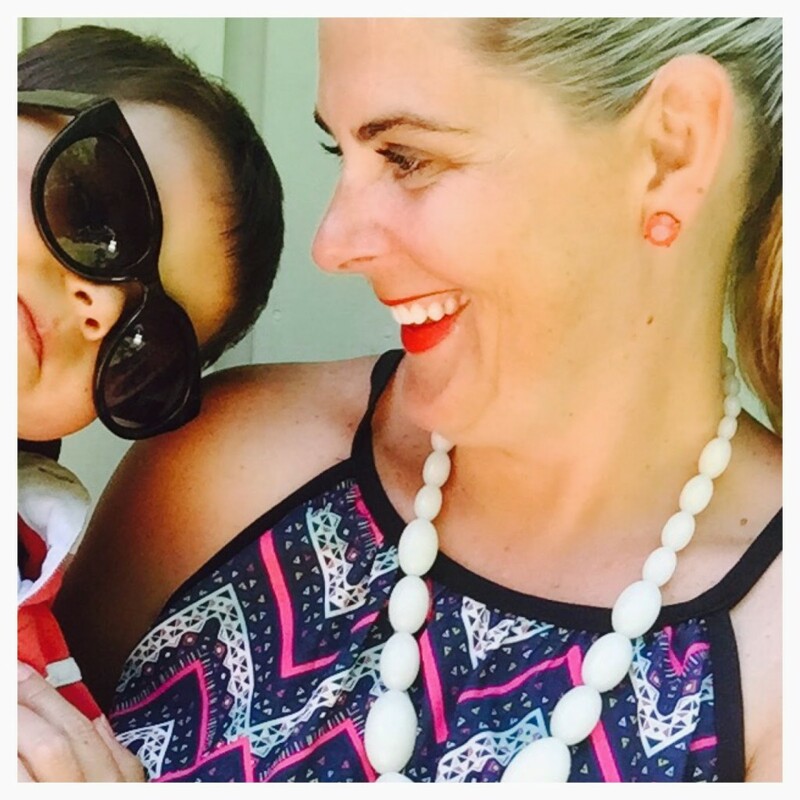 All things I’ve learnt on the job in my blogging adventures. Wouldn’t change it for all the tea in china. Have you found your summer jumpsuit? « The best $1.99 nail polish ev-ah! You look AMAZING in this jumpsuit!!!! Absolutely stunning. Love seeing your little guy pop in the pics with you 🙂 Great post! You have great style. Dig how the sandal details mimic the jumpsuit print. Thanks of noticing Nikki! You have good eye! I love love love to style outfits so this post was so much fun to do! Have a great day and thanks for stopping by! What wild colors! You will definitely be having a lot of fun wearing that this summer. Great find. Thanks for stopping by Brianna! Yes, some great colors and pattern too. A jumpsuit for Spring and Summer. I love it! You will certainly be seeing me a lot in this little number! Thanks for stopping by! I've always been super shy with jumpsuits, I don't think I could rock them and not as nearly as well as you! I love the colors of the piece you have it, it's gorgeous!